Bella certainly used up one of her nine lives as she found herself trapped inside a garage door that was rolled up. As Deputy Mike Scott appeared on scene from his office at Ascension Parish, he was in no way prepared for what he found. This 37 year police veteran had never had a call like this in all his years. 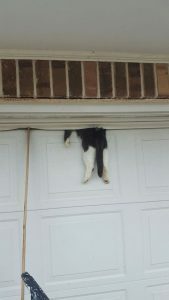 Bella, the cat was apparently sleeping atop the garage door at her home when her owner left for errands. He closed the door behind him, as he had done dozens of times and left, not having a clue that his pet was in danger. He was headed to the store for lumber and other supplies for repairs after his home had been damaged due to flooding. Helpful Neighbors and Sheriff save the day! 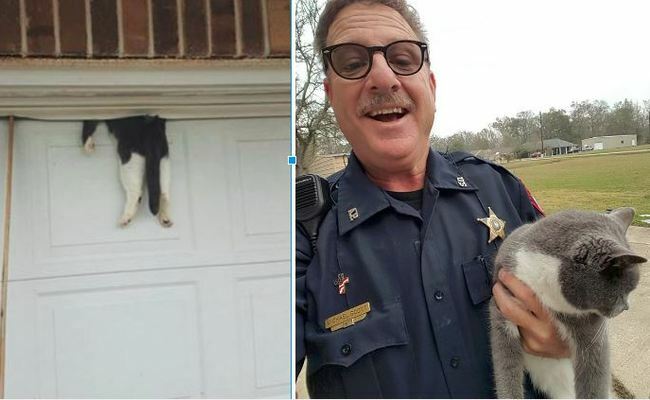 Neighbors sprang into action before Deputy Mike Scott had even arrived on scene, and when he did he was quoted saying, “Never in all of my years was I prepared to encounter what I saw upon my arrival,” Bella was suspended in air with her poor body literally rolled between the garage door and wall. At first, it appeared the animal had lost it’s life in the terrible accident, but it was discovered she was alive and well. Bella wins against the garage door! The pet cat, Bella, was checked for injuries, but was lucky to escape the accident with not even a scratch. Mike Scott was thankful saying, “Thank God for miracles and good neighbors,” You can be sure this owner will be checking twice before shutting his garage door next time. Not that Bella will probably decided to sleep on the garage door anytime soon either! This is one happy ending we were all thankful for! As a cat lover my heart sank seeing the image of poor Bella, but I was thankful for a happy result, as we can all use some good news! After this incident, you may be wondering if your garage door is safe. The simple answer is yes, we just all need to be aware of our garage door safety. 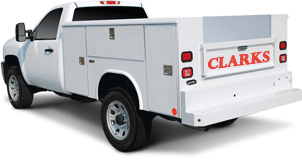 If you are looking to have your garage door inspected, call Clarks Garage Door & Gate Repair today for any garage door service! Whether it is garage door repair, garage door installation, or even gate repair, we do it all! Our expert garage door technicians are available anytime for your need, call us today at (877) 622-8183. We are here for you!